–Come fly with me, let’s take off in the blue: Over the weekend I had the opportunity to try a bottle of Boarding Pass Shiraz by Grateful Palate Imports and loved it. The label is fun: it looks like an air travel boarding pass with a luggage tag around the bottle neck as well as an illustration demonstrating how to open the bottle. They also have another wine called First Class with an equally fun aviation-related label. It’s subversive, like Danger Gals. I must try this wine and if it’s good it just might become the official beverage of choice at DG HQ. –Shave and a haircut. Oh noes! 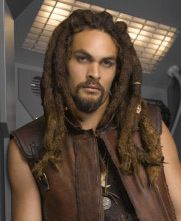 Stargate Atlantis spoiler: in the episode Broken Ties, Jason Momoa (Ronon) loses his dreadlocks. Evidently Momoa cut them off during the show’s hiatus. I’m glad they worked it into Ronon’s character arc. Hat tip: io9. –Think differently. The trailer is out for MacHeads The Movie. I love my Mac(s), but probably not as much as these people love theirs. –So many web sites suffer from “keming” that it pains me. My first objective as a designer is to eradicate Comic Sans though. Hat tip: Kraehe. –Taking one for the team. Evidently, infertile sperm in the ejaculate of fruit flies go all kamakaze for their band of brothers. –Matt Damon, Ben Affleck and Kevin Smith really get around. First, there was Sarah Silverman’s confession to boyfriend Jimmy Kimmel. Then, Kimmel, um, rebutted, with his infatuation with Ben Affleck. Now, Kevin Smith gets in on the game.